Artist’s rendering showing the Waterloo International Terminal. Image courtesy of Network Rail. The Waterloo Station upgrade will be completed by December 2018. Image courtesy of Bjørn Christian Tørrissen. The station upgrade includes addition of a modern accessible station concourse near platforms 20 to 24. Image courtesy of Diliff. London’s Waterloo station is one of the busiest railway stations in the UK, which provides more than half a million passenger journeys a day and 230 million a year. The station upgrade is aimed at enhancing passenger capacity by 30% by 2019. An £800m (approximately $1.18bn) investment plan for the station upgrades was unveiled in March 2016. The project is being managed by Network Rail and sponsored by the UK’s Department for Transport, South West Trains, Transport for London, and Wessex Capacity Alliance. The Waterloo station upgrade is a part of the £1bn ($1.5bn approximately) Wessex Capacity programme. The proposed upgrade includes spending £274m ($406.1m) each on track renewals and signalling enhancements, £182m ($269.8m) on bridges, tunnels, major structures, culverts, footbridges and earthworks, £127m ($188.2m) on building improvements, £88m ($130.4m) on electrification, £33m ($49m) on telecommunications, and £23m ($34.1m) on plant and machinery. Ten stations including Ascot, Bracknell, Camberley, Chertsey, Egham, Feltham, Martins Heron, Sunningdale, Virginia Water, and Wokingham will be extended to allow longer trains with room for more passengers. Other works include power supply upgrade, and maintenance facilities upgrade to handle the train fleet. The site preparation works on the station upgrade began in October 2015 and construction works began in December 2015. The Waterloo International station was closed for all trains services in April 2016 for construction. Platform 20 will be returned to Network Rail and train services will be reinstated by February 2017, while platforms 21 to 24 will be returned in July 2017, and former international terminal will be opened for temporary use in August 2017. The station will be closed again for passenger services so that the remaining construction works can be completed. Platforms 1 to 4 on the suburban network will be operated with ten-carriage services from December 2017 during the morning and evening peak periods. Platforms 21 to 24 will be opened and additional train services operating on a new timetable starting from December 2018. New rolling stock of Siemens-built Class 707 Desiro City trains will be introduced between London Waterloo and Windsor & Eton Riverside by mid-2018. A total of 150 new carriages will come into operation with first set of trains expected to enter service in mid-2017. The new trains will be equipped with free passenger Wi-Fi, air-conditioned environment, and improved on-board train information systems. "The station upgrade is aimed at enhancing passenger capacity by 30% by 2019." The addition of new rolling stock will take total number of carriages on the network to 1,599. 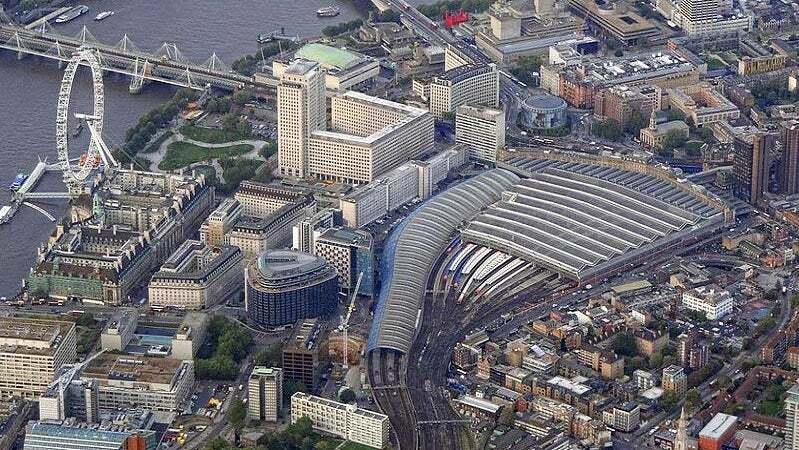 The consortium consisting of Skanska, Colas Rail, Aecom and Mott MacDonald was awarded with a £400m ($592.08m) contract to upgrade the Waterloo station in January 2016. The contractual scope includes bringing the international terminal at the station back into use for domestic train services and increasing the length of certain station platforms. It also includes delivering track alterations, signalling, communications, buildings and civil infrastructure along the Wessex Route and at Waterloo, Vauxhall, Clapham Junction, Richmond, Wimbledon and Surbiton stations. Aldridge Railway Signals is a wholly Australian owned manufacturing company.